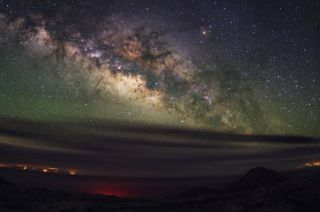 Erwin Matys and Karoline Mrazek of Project Nightflight captured this image of the Milky Way on June 6, 2013 from the southern part of La Palma Island, Canary Islands. The image was sent to Space.com on Feb. 9, 2014. Green airglow shimmers atop translucent clouds as the Milky Way rises over a remote island off the northwest coast of Africa in a majestic photo recently sent to Space.com. Erwin Matys and Karoline Mrazek captured this spectacular image on June 6, 2013 from the southern part of La Palma Island, Canary Islands. They took the image as part of Project Nightflight, an astrophotography project aimed at "capturing the beauty of the night sky." The foreground features the characteristic volcanic landscape of the Canary Islands. The faint lights are from neighboring islands, La Gomera toward the left and El Hierro. Tiny top-lights from a small wind park on the shore give off the fait red glow visible in the foreground. "During our exposures a small animal, we suspect it was a seagull, whistled incessantly," Matys said. "It probably tried to shoo us away from its nearby sleeping place." "The place was so remote, the bird was obviously used to absolute quiet, because it sounded definitely annoyed by our nocturnal activities," Matys added. On their Project Nightflight website, Matys and Mrazek write: "It is not our aim to produce images of scientific value. Much more we intend to present the hypnotic power and magic of the universe."